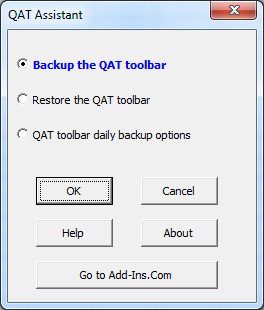 The Quick Access toolbar (QAT) in Microsoft Excel allows you to put any button or menu item on it for fast access. Its default location is above the tab names. But one can right click on it and relocate it below the formula bar. Once you discover this fantastic toolbar, you will add many buttons to it, and organize it just the way you want it. And, all goes great until one day THE TOOLBAR disappears!!! For no reason. It just disappears. And after hours of research you find that you can not recover the toolbar. Best of all, The QAT Assistant is FREE. No purchase ever required! Just download and install. Download now for the PC!